Barbary ducks at the Domaine de la Schleif, Soultz-les-Bains, Alsace. I’d better come clean right away: I rather like foie gras. Actually, that’s a lie - I love it. I adore its extreme unctuousness and its complex flavours. I seldom pass up a chance to eat it, and I get a definite frisson from the realisation that about 14 billion calories are contained in every slice. I’m not alone in appreciating this delicacy. Charles Gérard in l’Ancienne Alsace à Table described the goose as ‘that admirable machine which elaborates and produces the succulent substance known as foie gras’, and could clearly conceive of no other reason for the bird’s existence. Sydney Smith, the eighteenth-century gourmet parson, famously favoured eating foie gras to the sound of trumpets. More recently, Ruth Reichl, editor of Gourmet magazine, has labelled it the ultimate guilty pleasure. The pleasure part is easy to explain – it’s just so disgracefully delicious. And we’re not discussing anything that comes out of a tin here, we’re talking fresh foie gras, barely cooked or perhaps pan-fried. The guilt bit is more insidious, partly due to the calorie question, and partly to unease about the fattening process. It was the latter that led me to decide that if I eat and appreciate the stuff, I ought to go and see how it’s arrived at. Monsieur Lucien Doriath of the Domaine de la Schleif at the northern end of the route des Vins, near Strasbourg, agreed to take me in hand. Doriath is a man on a mission. His brief is to educate the public on the subject of foie gras and he receives busloads of visitors each week. On guided tours he brooks no interruptions. Giggling in the back row is absolutely not tolerated; we are here to learn. 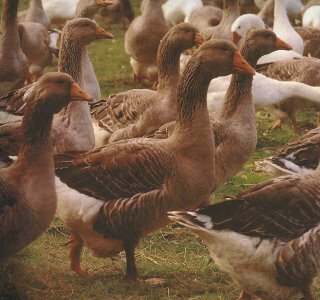 The grey Barbary ducks, specially bred for foie gras production, are raised on farms in the Saone-et-Loire region and arrive at the Domaine at the age of 14 weeks, weighing an average of 4 kilos. (Doriath only does ducks, no geese. Geese are more delicate animals to raise and fatten and he prefers the more assertive flavour of duck livers.) They spend the final fourteen days of their life in a special, temperature-controlled shed, where the visit starts. The temperature is agreeably warm, the lighting is dim. Twice a day Doriath climbs into each of the pens with his stool and a bucket of lightly cooked maize, grown to special order by a local farmer. The ducks seem unbothered by his arrival, and allow themselves to be taken on his knee without fuss. He reaches up and pulls down a contraption about the size and shape of a jam funnel, suspended from the ceiling by a pulley arrangement. The duck opens its beak expectantly and the prescribed quantity (which can vary slightly for each animal, depending on its body weight) clatters down through the funnel into the animal’s gullet. The duck swallows a couple of times, and Doriath massages its neck to ease it down. He pushes the animal off his lap and another bird takes its place. After 12-16 days of force-feeding (the term ‘cramming’ is also used in English), the ducks have gained up to 2 kilos in weight. Their livers weigh about 400 grams. Depending on the time of year – the run-up to Christmas is always the busiest period – between 30 and 60 birds are slaughtered each day. Everything is used: the feathers go to make duvets and pillows (1,300 kilos of feathers per year), the fat is rendered and canned. The legs are sold fresh or as confits, the breasts are marketed as magrets or (if skinned) as steaks. Some are smoked and finely sliced, to be eaten raw. The fattened livers – about 6 tonnes a year are produced - are offered either fresh or as semi-conserves; a few are put up in tins for longer keeping. Out at the front there’s a seductive selling space called Le Comptoir des Saveurs which does a brisk trade from Monday to Saturday (Sundays too, during December). Products are also sold by mail order. At the back there’s an in-house restaurant where by special order at lunch-time you can feast on poelée de foie gras frais du jour. For this delectable dish of pan-fried foie gras, the ducks have been slaughtered at 11 a.m. and the dish is on the table by 12.30. It would be difficult to have food fresher than this. Traceability is assured. So how was the guilt, after my trip? A little assuaged – at least as far as Doriath’s production is concerned. And the quality of the product? Fabulous. And my liver? Better not ask.